Fedora Workstation 24 is out and Flatpak is now officially launched! This is a very exciting day for me as two major projects I am deeply involved with are having a major launch. First of all Fedora Workstation 24 is out which crosses a few critical milestones for us. Maybe most visible is that this is the first time you can use the new graphical update mechanism in GNOME Software to take you from Fedora Workstation 23 to Fedora Workstation 24. 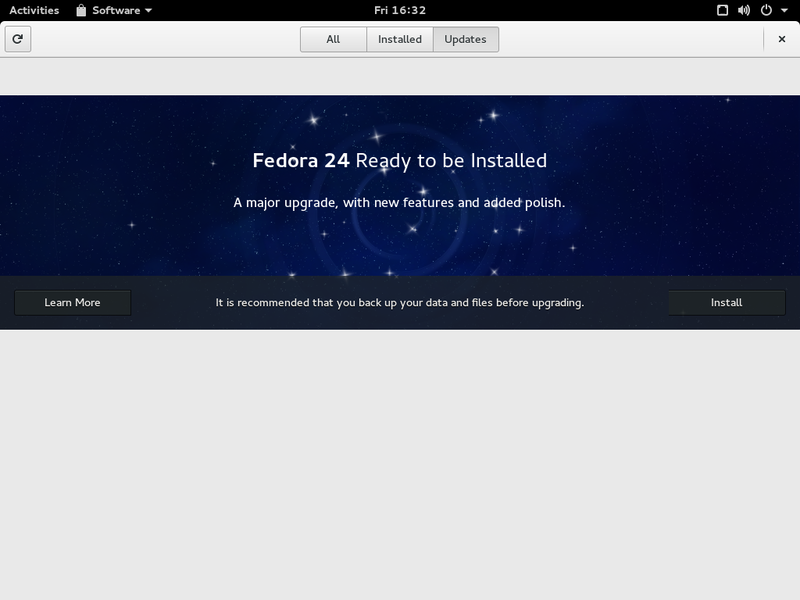 This means that when you open GNOME Software it will show you an option to do a system upgrade to Fedora Workstation 24. We been testing and doing a lot of QA work around this feature so my expectation is that it will provide a smooth upgrade experience for you. The second major milestone is that we do feel Wayland is now in a state where the vast majority of users should be able to use it on a day to day basis. We been working through the kinks and resolving many corner cases during the previous 6 Months, with a lot of effort put into making sure that the interaction between applications running natively on Wayland and those running using XWayland is smooth. For instance one item we crossed off the list early in this development cycle was adding middle-mouse button cut and paste as we know that was a crucial feature for many long time linux users looking to make the switch. So once you updated I ask all of you to try switching to the Wayland session by clicking on the little cogwheel in the login screen, so that we get as much testing as possible of Wayland during the Fedora Workstation 24 lifespan. Feedback provided by our users during the Fedora Workstation 24 lifecycle will be a crucial information to allow us to make the final decision about Wayland as the default for Fedora Workstation 25. Of course the team will be working ardently during Fedora Workstation 24 to make sure we find and address any niggling issues left. In addition to that there is also of course a long list of usability improvements, new features and bugfixes across the desktop, both coming in from our desktop team at Red Hat and from the GNOME community in general. There was also the formal announcement of Flatpak today (be sure to read that press release), which is the great new technology for shipping desktop applications. For those of you who have read my previous blog entries you probably seen me talking about this technology using its old name xdg-app. Flatpak is an incredible piece of engineering designed by Alexander Larsson we developed alongside a lot of other components. Because as Matthew Garret pointed out not long ago, unless we move away from X11 we can not really produce a secure desktop container technology, which is why we kept such a high focus on pushing Wayland forward for the last year. It is also why we invested so much time into Pinos which is as I mentioned in my original annoucement of the project our video equivalent of PulseAudio (and yes a proper Pinos website is getting close :). Wim Taymans who created Pinos have also been working on patches to PulseAudio to make it more suitable for using with sandboxed applications and those patches have recently been taken over by community member Ahmed S. Darwish who is trying to get them ready for merging into the main codebase. We are feeling very confident about Flatpak as it has a lot of critical features designed in from the start. First of all it was built to be a cross distribution solution from day one, meaning that making Flatpak run on any major linux distribution out there should be simple. We already got Simon McVittie working on Debian support, we got Arch support and there is also an Ubuntu PPA that the team put together that allows you to run Flatpaks fully featured on Ubuntu. And Endless Mobile has chosen flatpak as their application delivery format going forward for their operating system. We use the same base technologies as Docker like namespaces, bind mounts and cgroups for Flatpak, which means that any system out there wanting to support Docker images would also have the necessary components to support Flatpaks. Which means that we will also be able to take advantage of the investment and development happening around server side containers. Flatpak is also heavy using another exciting technology, OSTree, which was originally developed by Colin Walters for GNOME. This technology is actually seeing a lot of investment and development these days as it became the foundation for Project Atomic, which is Red Hats effort to create an enterprise ready platform for running server side containers. OStree provides us with a lot of important features like efficient storage of application images and a very efficient transport mechanism. For example one core feature OSTree brings us is de-duplication of files which means you don’t need to keep multiple copies on your disk of the same file, so if ten Flatpak images share the same file, then you only keep one copy of it on your local disk. Another critical feature of Flatpak is its runtime separation, which basically means that you can have different runtimes for some families of usecases. So for instance you can have a GNOME runtime that allows all your GNOME applications to share a lot of libraries yet giving you a single point for security updates to those libraries. So while we don’t want a forest of runtimes it does allow us to create a few important ones to cover certain families of applications and thus reduce disk usage further and improve system security. Going forward we are looking at a lot of exciting features for Flatpak. The most important of these is the thing I mentioned earlier, Portals. In the current release of flatpak you can choose between two options. Either make it completely sandboxed or not make it sandboxed at all. Portals are basically the way you can sandbox your application yet still allow it to interact with your general desktop and storage. For instance Pinos and PulseAudios role for containers is to provide such portals for handling audio and video. Of course more portals are needed and during the the GTK+ hackfest in Toronto last week a lot of time was spent on mapping out the roadmap for Portals. Expect more news about Portals as they are getting developed going forward. I want to mention that we of course realize that a new technology like Flatpak should come with a high quality developer story, which is why Christian Hergert has been spending time working on support for Flatpak in the Builder IDE. There is some support in already, but expect to see us flesh this out significantly over the next Months. We are also working on adding more documentation to the Flatpak website, to cover how to integrate more build systems and similar with Flatpak. And last, but not least Richard Hughes has been making sure we have great Flatpak support in Software in Fedora Workstation 24 ensuring that as an end user you shouldn’t have to care about if your application is a Flatpak or a RPM.